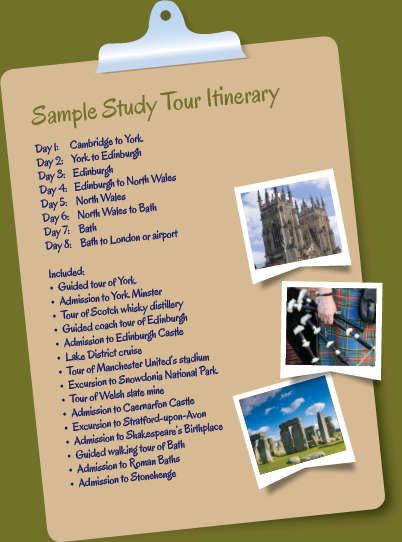 As well as offering a range of off-the-shelf excursions and day trips around the UK and Europe, we can also arrange bespoke study tours. Many groups coming to Cambridge find that their experience is greatly enhanced by including a tour at the end of their studies. These tailor-made tours of the UK’s towns, cities and countryside introduce students to our rich history and culture and are both educational and enjoyable at the same time. These study tours are totally flexible with the itineraries designed to suit your requirements, budget and time scale. There are no minimum numbers and we can arrange everything, from accommodation to travel and restaurant bookings to entry fees. If you are bringing a group of students or adults to the UK and would like to arrange a tailor-made study tour, why not contact us?